Nanking Cherry is one of my favourite shrubs. Their cascading early pink flowers are a very welcome sight in the Spring. And of course, I enjoy the bright red fruits in the summer, which I often snack on while I’m pruning a client’s yard. Sour and Nanking cherries make a nice specimen shrub or small tree for a small space. They look nice in a mixed planting with blue oat grass and a bearberry groudcover. Late fall to early spring. With nanking cherries, I prefer a natural shape. Prune as you would a miniature tree, removing deadwood, and the weaker of crossing and rubbing branches. Remove suckers at their base. With sour cherries, I use the same principle. However, with larger sour cherries I usually provide a crown reduction every two seasons once the shrub has grown past the point of being easily accessible for fruit picking. This also encourages the formation of new wood, and therefore more fruit. When heading back branches, use hand pruners and cut each leader back to buds or lateral branches. Newly planted cherries should be watered well during the first season to encourage root system establishment. 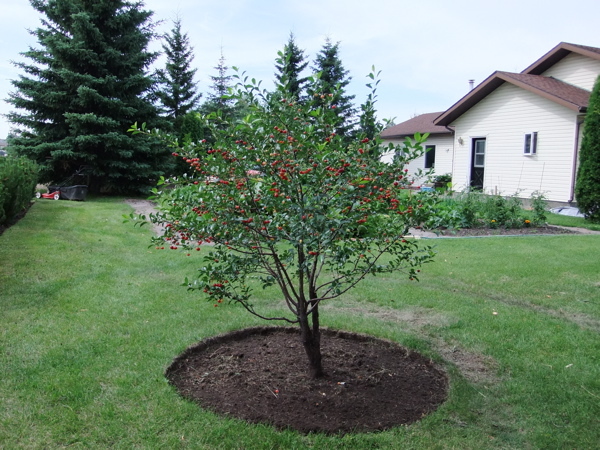 Plant cherries in a mulched bed to avoid competition with surrounding grasses. An infrequent deep watering is preferred to frequent shallow watering, in order to promote deeper root growth and improved cold tolerance. Sour cherries are prone to bacterial canker, as evidence by a honey-coloured gumming on the trunk. The best way to avoid bacterial infections is to plant disease-resistant stock, provide a well-drained, fertile soil, and adequate irrigation. Infected shrubs can still grow vigorously and produce a lot of fruit. (c) 2010 Shane LePage, Wild Rose Garden & Tree Service Inc., Red Deer, AB.